Being a college student means delving into many unknown waters, especially in terms of essays. You think you’ve done them all but somehow every time you start a new one for a new professor, you’re back in the now-what-do-I-do mindstate while staring at a blank Word Document. Every professor has different observations or certain aspects they want you to assimilate prior to proceeding to the writing portion. Unfortunately, we’ve all had those moments of agitated pondering. Even I’ve had my fair share of writer’s block as it pertains to topics and advancing towards a thorough paper. Though I can’t help you think of a thesis for whatever essay you have in your schedule at the moment, there is a certain technique that can work for all critical or research induced essays: new criticism. Unless you’ve taken classes concerning literature techniques, studied different types of ways to make a successful essay or simple as that, are an English student, then you probably already have the concept of new criticism embedded into your brain. For those who don’t, understanding the general explanation of this new, unfamiliar term first, would benefit. New criticism bypasses the author and the reader, and instead focuses solely on the perception, theory, and precise approach to the work itself. Though we thank the author for the work they’ve done, the new criticism technique requires that in order to study the work itself, it must be its own spotlight. It is common and alright to go back to the author for biographical information, but they are not the focus. New criticism dives into the complexity of a work, unifying the text together to better understand it. This technique is actually consciously and unconsciously used by both students and teachers alike. As best quoted by Steven Lynn, “everything should contribute to the work’s unity – figures of speech, points of views, diction, imagery, recurrent ideas or events, and so forth” (Texts and Contexts 22). Does any of this sound familiar? Even if you’ve just graduated from highschool, yes, this concept is not so far gone from your mind. Almost every teacher that teaches literature in some form uses these ideas because they too were taught it. 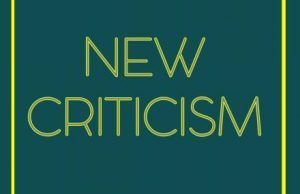 The importance of new criticism is throwing away outside distractions to create a paramount analysis of the literary work. This includes the author (as said above), titles, and even dates. To make your essay stand out and sound as intricate as possible, the first approach you want to make in terms of new criticism is already proposing that the work you’re writing about has a deeper, more convoluted statement that you have yet to find. What sorts of oppositions does the work take on? Are there any ironies or subtleties that can be further interpreted? Next is to consider the consolidated idea being brought to you and how it pertains to these ideas that you’ve concluded are embedded into the work. To finish, of course, the final step you should take and this is a very common, known strategy: the details. What sorts of details or examples can you take from the text to ultimately support your unifying idea of your analysis? This technique works best when the paper focuses on deciphering a poem. Poems take an experience and defines or searches for the meaning of it through metaphors, similes, and best of all, imagery. They are more allusive and elusive than a short story or novel, which provides an open window for you to interpret. Don’t be discouraged if a poem is not what your deciphering for a paper, however. Poems just have a stronger spotlight on them in terms of new criticism writing. Whatever you’re analyzing, try this technique whenever you have a critical essay in some shape or form and if the professor requests that you put information about the author in your work as well, just do it. Approaching your essay with a new criticism view will make you fill out pages in no time with three simple steps. The important thing to remember when beginning it is this; however simple it is, there is something more ingrained in the writing that can be defined. You are defining an experience so make it an experience while you write.